Local ties (LTs) at co-located sites are currently used to combine different single-technique solutions to determine global terrestrial reference frames (TRFs). We assess by simulations the impact of different LT standard deviations, biased LTs and a selection of LTs on the datum realization of global TRFs. The simulations are based on Global Positioning System (GPS), Satellite Laser Ranging, and Very Long Baseline Interferometry (VLBI) observations covering the time span 2008–2014. We find that LT standard deviations of 1 cm and better yield differences in the TRF-defining parameters below 1 mm. VLBI is most affected by altering the LT standard deviations, especially in the translations since VLBI is inherently not sensitive to the origin of the TRF. Altering the standard deviations of the LTs applied in ITRF2005, ITRF2008, ITRF2014 results in small differences reaching a maximum of 0.6 mm at the VLBI stations. Simulating technique-wise biased LT stations shows the largest differences in the TRF-defining parameters of more than 2 mm, if all GPS LT stations are biased by 1 cm, proving that GPS plays the major role in the connection of the three techniques. Simulating single biased LT stations by 1 cm in either the north, east, or height component indicates small differences of less than 0.8 mm in the TRF-defining parameters, the largest differences result at LT stations located on the southern hemisphere. The selection of LTs demonstrates that the southern hemisphere LTs are very important, especially for the realization of the scale. 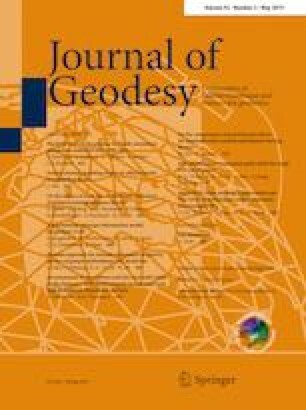 This work has been supported by the German Research Foundation (DFG) under Grant Number SCHU 1103/8-1 (GGOS-SIM, Simulation of the Global Geodetic Observing System) and by the Helmholtz-Gemeinschaft Deutscher Forschungszentren e.V. under Grant Number ZT-0007 (ADVANTAGE, Advanced Technologies for Navigation and Geodesy). The IGS (Dow et al. 2009), the IVS (Schuh and Behrend 2012; Nothnagel et al. 2015), and the ILRS (Pearlman et al. 2002) are acknowledged for providing data used within this study. The authors would like to thank Claudio Abbondanza and two anonymous reviewers for their valuable comments on the manuscript.